Mrs Ogilvie, age 60, is a widow living at the Hewan, a picturesque cottage near the village of Eskholm. Her son Robbie had "strayed" often during his boyhood, and finally as a young man he had left home altogether. Fifteen years have passed, and she thinks of him every day, as does Susie, the minister's daughter, whom Robbie had once courted - after a fashion. Now Mrs Ogilvie hears of a murder in America, in which Robbie may have been involved. Before long Robbie comes home, rough and rude, and expressing fears of his old companion Lew in America. But when the outlaw appears, Robbie is once again under his spell; and over the next few weeks the two men make havoc of Mrs Ogilvie's quiet home. Finally as the situation is becoming unbearable, Mrs Ogilvie begins to feel real fear. This is a suspenseful novel leading to a dramatic scene near the story's end. 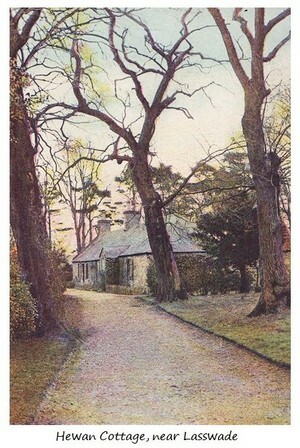 The village of Eskholm was based on Margaret Oliphant's favourite childhood home, Lasswade; and the Hewan was based on a real cottage of that name. For more information, see the link below on Lasswade.